This week I’ve created my own adventure game. I didn’t mean to, it’s just turned out that way. In the name of finding some amusing (and frustrating) strategic games I headed towards some old favourites, only to discover that they had been dismantled and sold as scrap. 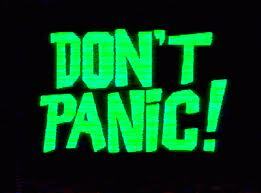 In 1984 Infocom and Douglas Adams released an adventure game version of the Hitchhiker’s Guide to the Galaxy. Employing the same wit and tangential narrative of the original books and radio plays, the game was a huge hit. Then graphics arrived and people forgot how to read and write and the age of text-based interactive fiction, better known as adventure games, became a chapter in geek history. BBC Radio 4 (yes, radio!) did have a graphical version of this game, which worked about a year ago (or maybe two) but has been terminated. Ironic that pressing the “DON’T PANIC!” button now reveals the laconic phrase “zmachine xml invalid”; this is as terminal as it gets. So, if anybody can find a working version of this game hiding in some corner of the net, then let us know, otherwise it’s back to the Douglas Adams page for the original text version. 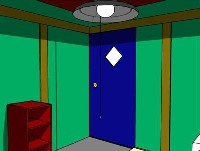 The graphical style of H2G2 reminded me of the claustrophobia of the room escape classic, the Crimson Room. This point-and-click game is a kind of bonsai version of the adventure game genre. Toshimitsu Takagi is the creator of the Crimson Room as well as other, similar games such as the Viridian Room and the Blue Room. However, the Crimson Room requires one piece of information that is only available from a website that greets the visitor with a “404 Not Found”. This has, quite naturally, resulted in a host of cheat sites who have figured out what the code should be. In the meantime, Mr Takagi seems intent on selling his game, even though millions have already played it for free. Last time I looked he had a mobile app version but that too seems to have gone. I understand he would like to make some money, but do it by selling one of the newer games. Anyway, I’d suggest playing the Viridian Room for the experience of these miniature puzzle games. And so I found myself standing at the end of the road, staring at a garden littered with the rusting remains of old games that have been treated unkindly by the superhighway of entertainment that could be seen in the distance. The once splendid mansion looked forlorn and covered in a pall of weeds. A light flickered through a downstairs window and I walked towards it. 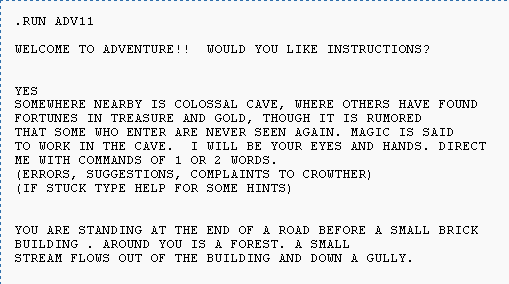 Here was the resting place of the first ever computer adventure game: the Colossal Cave Adventure. an English major who's never glanced at Shakespeare." — Steven Levy. The game was developed in 1976 by William Crowther, with an enhanced version coming out in 1977 by Don Woods. You can find the various versions here at RickAdams.org plus a ton of further information. I recall playing this in around 1979 but only because I had access to a local polytechnic mainframe. Those were the days when a dot-matrix printer would clatter away for 5 minutes, print what looked like a spindly spider, and the Professor would proudly announce it as a Mandelbrot set! The game was so complex that me and the other students had to draw a map of the cave structure as we went along, including which objects lay where, and the likely locations of the various trolls and dwarves. So that everyone is playing the same game, I’d suggest downloading the Adventure 5 game. If you have a Windows machine then download the DOS executable. If you have a DOS machine then you really should have thrown that away years ago. If you know what FORTRAN is, then you probably have grandchildren. If you own an Apple machine, there are a couple of OS/2 versions available. Just look at the page! If you've never seen a DOS screen, welcome to computers in the 1970s. And so, my quest has ended with only partial success. In an age where computing is driven by the media these games will all seem very retro. However, do not be fooled by their unpolished exterior – these are not easy to play! Being met with a blank screen and a blinking cursor is no way to sell a game, and yet all the above games have been hugely popular and continue to have a following as each new generation comes across them. Is there any mathematics to be found in these games? Perhaps not, but the strategies used in solving complex mathematical problems are similar. Sometimes you just have to look around, sometimes you need to play with the pieces to see what happens, sometimes you need to simplify each task, and sometimes you may feel lost and need to start again. It's not enough to know all the answers, you also need to know how to find an answer when you're clueless. Being given a solution with a neat piece of obscure theory just doesn’t help you become an independent thinker; just as searching for hacks and walkthroughs may impress your friends but you will look foolish when faced with a new challenge. Sometimes life feels like a maze of twisty little passages; the skill is figuring out that they are not all the same. Feedback always appreciated, just add a comment below.